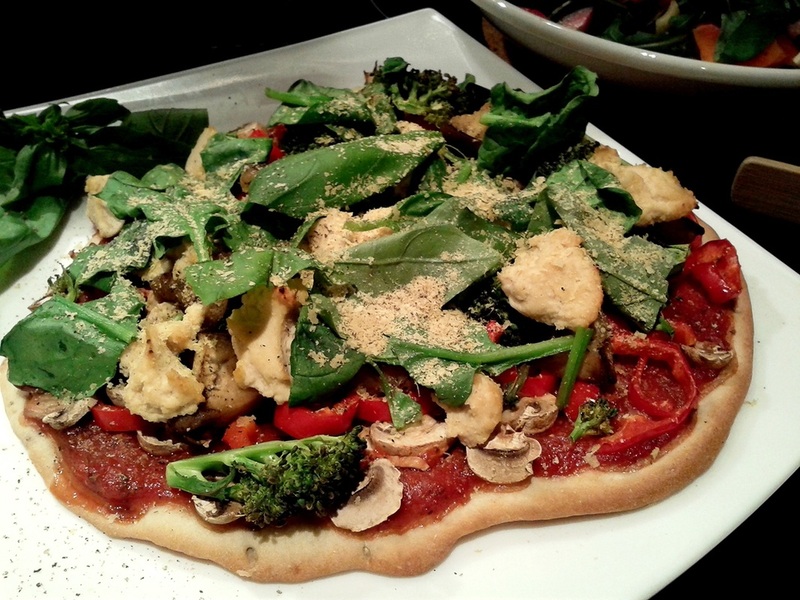 Your choice of toppings such as: Mushrooms, Peppers, Olives, Aubergine, Onion, Butternut Squash, Spinach, etc. If you don't have time to make the sauce, you can just use tomato purée, or even a ready made pasta sauce if it's not too runny. Using a bread mix also speeds the process up a little while retaining a fresh just-baked quality missing from many pre-made bases. Equally, shop bought 'Not-Cheese' is acceptable if less satisfying; see Not-Dairy for details. Nutritional Yeast is an unimaginatively named condiment that looks unfortunately like like fish food flakes but is an excellent Parmesan substitute and a great source of B vitamins. See Not-Dairy for more. If using quick cooking ingredients such as spinach, add this at the end of cooking and allow to wilt briefly in the cooling oven. Some toppings, such as Butternut Squash and Aubergine will benefit from a bit of pre-cooking as the base will cook more quickly.